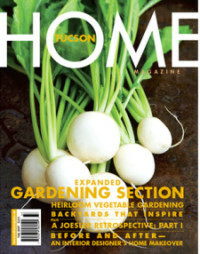 I found out today that Yong’s veg made the cover section of Tucson Home Magazine. 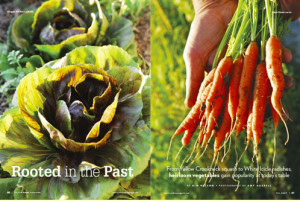 She handed me a copy of the magazine and a huge back of veggies: okra, greens, tomato, cucumbers. I was so psyched to get home and cook things up. So….i sauteed the okra with white onion, cumin and curry. The best smell! I sauteed the greens with garlic from her farm and a little salt. Served them both with pita. It was SO tastey!!!! They have the best greens. 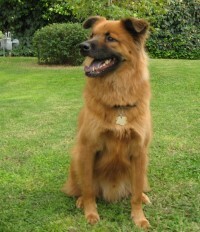 After walking Codybear, (he was such a good dog)…..I ended up taking him for another walk an hour later. After which I had a nice bike ride about 3 times longer than yesterdays. Full moon tonight. 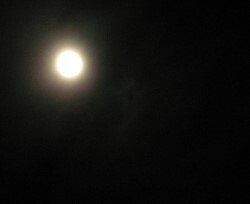 The moon was bright white with a milky corona about twice its diameter. It was so easy to see, but i will definitely have to get a light kit for the bike if I want to keep this up. Its the law, plus, its a really dark town, very little light pollution and moonless nights are tough, even with my superultrafantastic night vision. Star craving lunatics! Tonight is YOUR night: a full lunar eclipse starting around 1:30. ……I won’t be up that late…..
After work, Codybear and I drove over to “the collective Hannah” so Dave could have one of Yong’s fresh tomatoes. 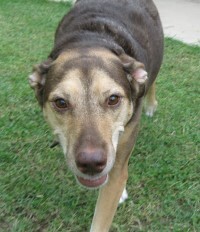 The dogs romped while Dave mowed the lawn. I injured my arpit today. An unwanted distraction caused me to impale myself on an iron boom holding a strobe at the studio. Armit injuries really, really hurt. You would be surprised. Today, Mike Vick tossed in his plea to his federal dog-fighting charges. During his plea he “axed Jesus” for forgiveness. I will refrain from commenting, but you alllll know what I’m thinnnnnking. Tonight I took my first bike ride on Kombi Lux! Haven’t ridden bikes as an adult, but tonight I went on a moonlight trek through the neighborhood after my evening walk with Codybear. Couldn’t help but smile and it really was the best my posture has been in ages. The bike is in the picture above. 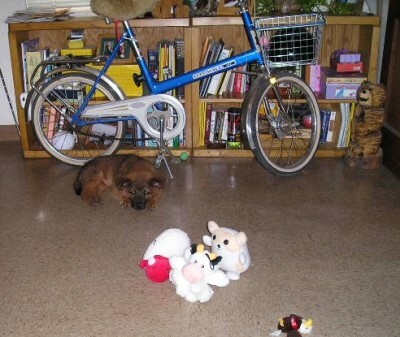 I got it when Codybear was still a puppy and have never ridden it. If anyone knows anything about thes Kombi bikes from Norway, please leave a comment! I can’t find ANYTHING about them on-line.